We had leftover roasted chestnuts from the Thanksgiving stuffing. Enough to weigh on the conscience and keep in mind for an eventual trial run on chestnut soup, but not really enough to actually do the soup without recruiting reinforcements (more nuts). And doing soup is tough for the dr bob cooking team since it takes more of a time investment than is usually available. But if outside guests are invited, this time can be found. A few months after Thanksgiving the team starts out the first month of the true third millennium (Y2K+1) with two lasagna Saturdays at home after an earlier refresher course on the road at rita's, daughter of gabriella, relocated in the States within a reasonable driving range. For us, authentic lasagna takes all day to produce, although sauce simmering time does allow us to escape for a while midway. Doing it Saturday works for the convenient Saturday night dinner gathering, leaving a day of rest afterwards for the Monday thru Friday working crowd. On the second such Saturday bob made the mistake of not pulsing the celery destined for the Bolognese sauce. While food processing. Turning away momentarily after hitting the on-switch, bob discovers for the first time how quickly celery can be turned into mush. (He'd already learned this lesson with onions.) Initially he was determined to use it anyway but on second thought, it seemed wiser to restart with some other celery. Leaving a lonely pile of celery mush sitting in green juice without a clear future. The result? Well, no one forced the guests to rave about the soup, which they did repeatedly. They could have just been polite. But this unsolicited praise confirmed our own impression. It was another apparent cooking team success story. Start by preparing the chestnuts if you don't find them already to go in a jar like we had for the stuffing. Preheat the oven to 400° F, cut an X into the end of each chestnut to prevent exploding nuts, and roast in a shallow pan for a half hour or so. Remove and crack open with your handy large nut shelling tool while still warm. After cooling a bit, food process into crumbs. Warning: Even if you start with steamed chestnuts as we always do now, you have to bring out their flavor by roasting in the oven for some 15-20 minutes, then cool and crumb. From later experience, it is okay to food process all of this stuff to a pulp, but keep the potato separate to add after cooking the onion-leek-celery mix a bit. Start about 5 c of water boiling in a teapot for the veggie broth. Next melt the butter in a large pot that will hold all the soup (nonstick works best, we use our 4qt Calphalon professional flat bottomed pot) and saute the onion, leek and celery until well softened. If you mush your celery, you can add them in after this stage with their juice. Put 4 cups of boiling water in a measuring glass and sufficient veggie broth paste or powder. Our powder package said 4 heaping teaspoons so we went with that, unable to find our trusted paste product in recent times. Add the chestnut crumbs (or puree), potato and broth, then the generous salt and pepper and bring to a boil. Simmer for about an hour. Puree with your trusty electric handblender. No kitchen should be without one. Add in the light cream, which can also be done with the handblender, and reheat through. This can all be done ahead of time and the soup reheated for the performance, as we did. Adjust for spices. For a moment we thought about the crema di marrone (chestnut cream) from the carry-on glassware story, but it was sweetened. For spreading on bread or waffles or pancakes or just direct spooning like Nutella or dulce de lecce. In spite of all the chestnut roasting experience in ani's past, one still exploded in the oven. No casualties. For years ani was lusting after a big ugly soup tureen, which is a big covered china piece only good for serving soup which can perfectly well be served up in our beautiful pots. And bob was discouraging her from acquiring one. But was thwarted by sister-in-law susannah who presented one to ani at christmas. Not much bob could do but grumble. This occasion was the first use of the tureen. We heated it by sitting it on the hot stove first and then transferred the soup to it before serving. The sky did not fall. Maybe it was not such a bad thing to have after all. For our second run through of this recipe, ani had found a 14.8 oz (420g) jar of steamed chestnuts at Trader Joe's for only 6 bucks (compared to 10 bucks at Williams-Sonoma a few years earlier!) so she grabbed it with the soup in mind. In the actual execution for an intimate dinner with the parents-in-law, we were in the middle of dinner prep when we read step 8 (simmer one hour) so the soup serving had to be postponed till the next day. But we got a taste after the puree step and it was a terrific preview. Made about 10 cups, just enough to fit in our square 10 cup Rubbermaid plastic container for safekeeping. And it was really good. So good we made it again shortly afterwards for a larger in-law group. Nice when people rave about your food. Well, we kept making this one because it is really spectacular, but the downside is that recipe ready chestnuts are not only seasonal, but can be outrageously priced. Up to 12 bucks a bottle in Fall 2002 at Williams-Sonoma with a chestnut soup recipe promotion to help move the product (one of the few times we have been ahead of the crowd! ), which we rebelled against and did the mushroom version again. But then Trader Joe's had some packages of frozen roasted chestnuts (8 bucks for two packages needed for the soup) so we grabbed a few before realizing at the time of use that they were unshelled, and very tedious to shell after the freezing/unfreezing process, breaking our resolve not to give in to Williams-Sonoma for only 4 bucks difference. BUT then Trader Joe's sent us their fall flyer advertising their previous CHEAP jars of steamed chestnuts, even cheaper at only 4 bucks for the one jar necessary, so we bought a bunch, knowing we would have to use them up within 6 to 8 months. We won't get tired of this recipe. Those of you living in Paris don't have to wait for fall, since apparently the upscale food market at the upscale department store we hit during our long weekend almost spring visit there has them all the time (see below). Maybe this is an indication of more widespread availability? However, moving to Paris just for convenient nut access is not recommended. The Williams-Sonoma recipe even refers explicitly to its expensive French chestnuts, but Trader Joe's at first imported them from Spain. Both in 14 or 15oz jars, about 400 to 425 g, must be European size bottles. Later they began selling vacuum packed chestnuts in the Trader Joe 8oz size (seasonally, fall only usually), requiring 2 packages. Chestnuts turn out to be lowfat, and were once a part of the native American Indian diet. Looks like both the American Indians and American chestnuts got screwed by history, the latter by immigrating blight bugs, the former by immigrating aggressive white men. Having bought so many bottles that season, we decided to try the other W-S chestnut soup recipe, the one with carrots, see below. 1 lb chestnuts => 12 oz upscale mushrooms, cleaned and chopped. split the stick of butter in half, use half for sauteeing the onion-leek-celery mixture and half for sauteeing the mushrooms in a separate nonstick pot, with a hit of 1/4 c Marsala wine evaporated off at the end of the mushroom saute. We used a 1/2 lb (= 8oz) package of baby bellas (small portobello mushrooms) and a 4 oz package of mixed upscale mushrooms: creminis, oysters, not sure what else. We looked in our cookbook library and saw a saute time of about 5 minutes, during which the mushroom liquid comes out, but we must have had them in there 10 minutes before hitting them with the Marsala wine that two different Italian soup cookbooks suggested, taking a few more minutes at higher medium heat to evaporate it off a bit. Then we dumped the mushrooms into the other pot and added the remaining ingredients, including the light cream, and proceeded, although we could not wait a whole hour before starting our dinner. The cream separated along the way but pureeing made it look okay anyway. Perhaps one should add the cream at the end and just heat through. Maybe a real cook could tell us. No matter, the result is what we had hoped. Delicious. Trader Joe's way-cheap prices facilitate an oversupply of recipe ready chestnuts in the dr bob kitchen in the 2002 Thanksgiving preseason, calling for some experimentation with the excess product. We like carrot soups but it is hard to find the right way to temper the sweetness of the carrots to satisfy our fickle tastebuds. The Williams-Sonoma recipe pushing their chestnuts this season is relatively similar though with a shorter ingredient list to what we have already been doing, so the alternate recipe with carrots catches our eye. But 4 lbs of carrots? bob looks at the little bag he brought back from the supermarket. Only 1 lb. ani vetos another trip to the supermarket for another pound to at least increase them a bit compared to the recipe target. But this time celery is on hand, unlike the carrot bean soup event when more carrots substituted the missing celery, so 4 stalks make up the difference, after pulling all the yellow outer stalks off and chucking them. Yeah, 4 lbs would have been way too much carrot. And celery has already proven itself to be a good chestnut companion. 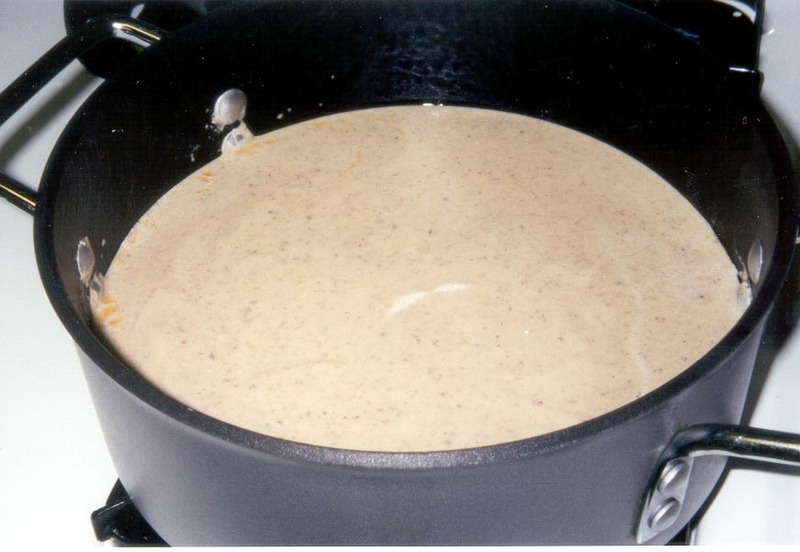 The original recipe also recommends passing this soup through a chinois, which is a fancy conical shaped French sieve with a pronunciation way different from its spelling (shin-wa? ), the net effect of which is to make the soup much smoother but remove valuable fiber from the diet, reducing the body's defenses against colon cancer which is a current hot topic, striking even the Osbournes during their 15 minutes of fame that are lasting a bit longer than one might have imagined. It also recommends serving this with some finely chopped parsley in whipped cream, but plain yogurt dolloped on at serving time is a better idea healthwise. Mixing in chopped parsley is just extra work. Peel the carrots and chop into 1 inch lengths. Coat with the olive oil and season with salt and pepper and roast in the oven at 400° F for about 45 - 50 minutes. Must give the soup extra flavor or something. Meanwhile, sauté the shallots in butter in a big flat-bottomed nonstick soup pot and soon after add the finely processed celery and continue until both are softened. Boil some water in the teapot for the veggie broth. We use about 4 t of the paste added into the 4 c boiling water. When the carrots are done, add in the simmerables to the soup pot, bring to a boil and simmer for about 15 minutes on medium low heat. 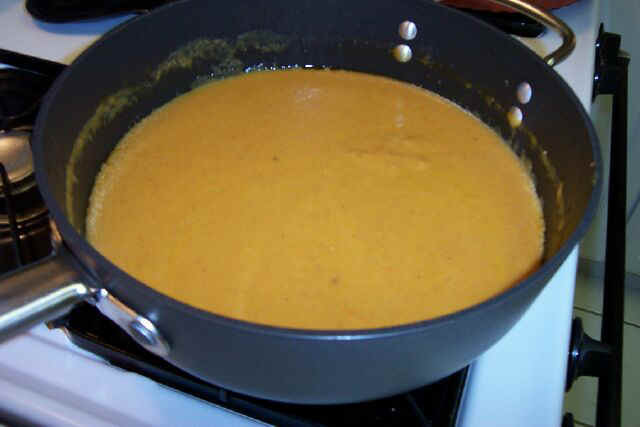 Remove the soup from the heat and puree it with a hand blender until smooth. Stir in a cup of milk to thin it out a bit and lighten the color. Check the seasoning. Reheat a bit if necessary. Serve with small dollops of optional plain yogurt. We liked this one too. After all, no need to wear out a good recipe by repeating it too often. Trying variations reduces that problem. On the other hand, an oversupply of recipe ready chestnuts is probably not a problem for most of us. And an undersupply can always be remedied by web shopping. If quality is an issue, you can do the work yourself.